With Valentine’s Day around the corner (retail reminders started December 26th), it’s time to turn our attention to winter’s chocolate and flower fueled February romantic holiday. A master of emotional entertainment, the Walt Disney Company offers several sweet selections for romantic review. Thus, in lieu of passing out conversation hearts, I’d like to offer this animated accumulation of the 8 best Disney cartoon romantic moments. This romantic rendezvous between Aladdin and Princess Jasmine brings a whole new world of possibilities to the realm of sightseeing. As if an enchanting dance with the Prince at the castle ball isn’t enough of a hint at romance, dancing to the tune of “So This is Love,” pretty much seals the deal. A candlelit spaghetti and meatball dinner under the stars set to romantic Italian music is not something you see a couple of cute canines enjoy. However, “Bella Note” will always appeal to my Sicilian side. Much to the chagrin of Timon, a grown up Simba falls for Nala. “Can You Feel the Love?” is the perfect ballad for this mushy montage. After all the monstrous mishaps of his Christmas take-over attempt, Jack finally recognizes Sally as his perfect match. “We’re Simply Meant to Be” closes “Nightmare” yet sets up so many delightfully dark dreams. A chance meeting on the train platform evolves into a wonderfully whimsical version of paperwork which ultimately brings George and Meg together. This cleverly cute cartoon was first shown in theaters just before “Wreck it Ralph.” It remains a shining example of speechless story telling. Even Walt Disney’s very first feature length animated arrival featured a memorable romantic moment. After searching for Snow White, the Prince bestows love’s first kiss and breaks the spell awakening Snow White. Beautiful and bittersweet, Carl and Elle’s life together is summed up in this charming montage of married life. The trials and triumphs experienced by the two testify “true love” is possible. Disney animated romance isn’t limited to these eight examples. Almost every feature length animated amazement (and several cartoon shorts) from the Walt Disney Studios have their romantic revelations. Scenes in “WALL-E,” “101 Dalmatians,” “Beauty and the Beast,” and “Princess and the Frog” all have their moments of love, any one of which would make a wonderful date night for any diehard Disney fan. 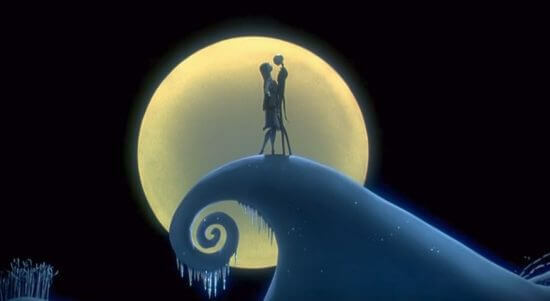 What is your favorite example of Disney animated romance? Please share your comments below.